This month marks my fourth year making games. 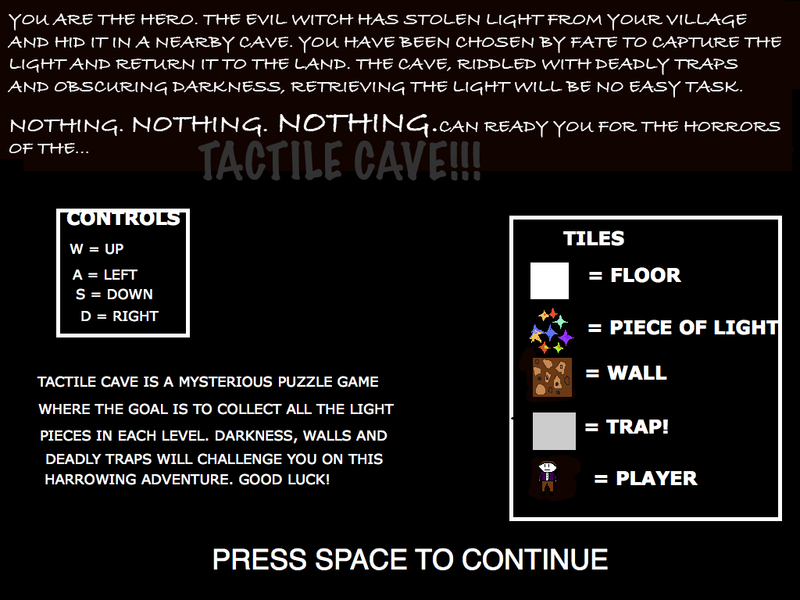 This was my very first game, Tactile Cave, which was made four years ago this summer. In San Francisco, there is a children’s science museum named the “Exploratorium” in the Palace of Fine Arts. Within, there is an attraction named the “Tactile Dome”, which is an indoor maze left completely unlit. Visitors must rely on their sense of touch to move about the maze to the end. This game was heavily inspired by this attraction, featuring three levels of dark, tactile goodness. I originally thought I would be a journalist, but when I ended up spending a summer at the COSMOS Summer Camp at UC Santa Cruz studying a games course, taught by then Ph.D candidates Anne Sullivan and Gillian Smith, things changed. I worked with Davis Huang and Daniel Xu to make a Processing-game called “Tactile Cave”. So I decided to take the videogame thing and go as far as I possibly could with it. Later that year, I wrote an open-letter to Leland Yee and the Supreme Court defending videogames during the Brown v. EMA case, which got his office’s attention. Soon after, I tried multiple times to make a dream game I had come true, enlisting the help of Bard Sodal and calling ourselves “Subtle Stone”, which was a pun on Bard’s name. I moved down to Los Angeles that fall to study at USC Interactive and met some incredible people, and now I’m in Dundee, competing in Dare to be Digital for a BAFTA. I don’t like to think in capitalistic narratives of “progression” and don’t think they’re right for most creative folk, but I see this game as a bit of a turning point in my life. A catalyst that led me to where I am now. Tactile Cave started as a rougelike, and it isn’t very good in retrospect. Your choices are very limited, and success is mostly a matter of trial-and-error. It doesn’t work on most machines without an annoying Java plugin, and the art is ugly, and the music, stolen. I couldn’t program at the time, so I was then responsible for handling art duties and designing levels using graph paper. To be honest, I don’t really feel too different now from how I felt four years ago. I’m a much better designer than I was back then, programming comes to me much easier. Maya can be great fun when it cooperates. I know Unity well now, and I’m teaching myself Unreal 4 for Advanced Games. But I don’t think mastery ever comes, there’s still much to learn and so many things you aren’t ready for. Emergent mistakes that you learn from but aren’t prepared to make. Project-to-project, you never are really certain what you’re doing. Its never easy, and as you’re moved up and up and up, never really sure what people see in you and how you could possibly be qualified for anything, more and more weight is packed onto your decisions. You don’t quite “master”, but “discover”, as you tread down and down and down this microcosmic rabbithole. You grow to love that uncertainty, live with it, make it part of your identity and come to embrace that precariousness with a new name: “excitement”. The decisions that my team and I make over the next week will determine what happens to Chambara and, if our decisions are good, what happens to us.